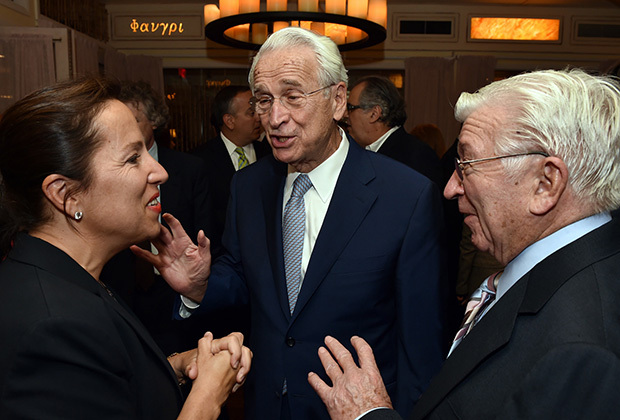 At age 43, Eleni Tsakopoulos Kounalakis became not only one of the youngest women ever to serve as a U.S. ambassador, but also the very first Greek American woman. 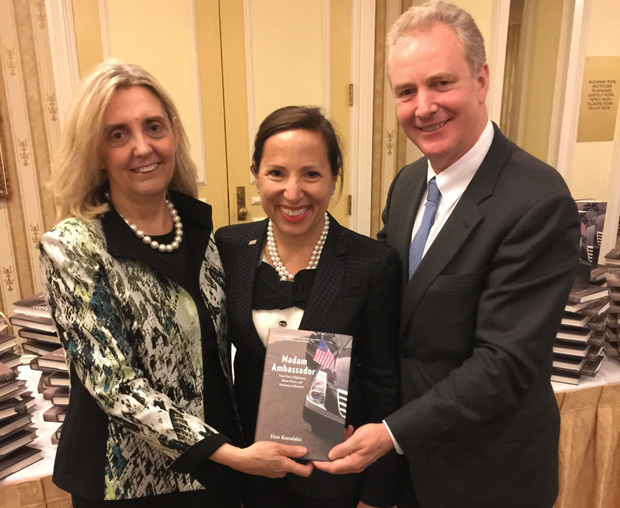 A powerhouse businesswoman and mother of two, her three years as U.S. 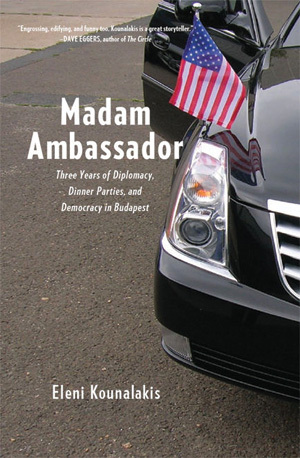 Ambassador to Hungary starting in January 2010 are recounted in her very candid and very personal memoir Madam Ambassador: Three Years of Diplomacy, Dinner Parties, and Democracy in Budapest (The New Press). Have you been back to Hungary since? Yes. I was invited to return to Budapest last summer when the ‘property swap’ that I write about in my book was completed. 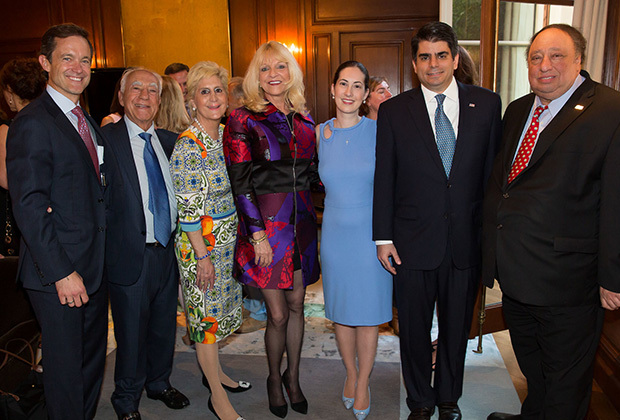 It was very gracious of the Embassy to invite me for the occasion, as it was certainly one of the most tangible accomplishments – if not the most publicized – of my tour. (The far right party) Jobbik is gaining ground. Does that dismay you? The rise of nationalistic, anti-Semitic and anti-minority political parties throughout Europe – including in Greece – dismays me a great deal. The rise of Jobbik is particularly disturbing because many of the greatest periods in Hungarian history are defined by having an open and tolerant society. Likewise, some of the most devastating events – the Hungarian holocaust in particular – came when that tolerance collapsed. (Prime Minister Viktor) Orban is getting cozy with Putin. Does that dismay you? As to Russia, I am very dismayed by the general deterioration of relations between Russia and many of its neighbors and partners, including the U.S. From the way I saw events unfold, the United States reached out a hand of friendship and cooperation when President Obama launched the ‘reset.’ It is very unfortunate that the unmistakably friendly overture was rejected. But I believe this has more to do with President Putin pursuing his interests than in any failure of the United States. Do you miss being ambassador? Serving as a United States Ambassador was the honor and privilege of my life. At the same time, three and a half years was a long time for my family to be in Budapest, and we are all very happy to be back home in Northern California. It is also a special privilege that the government honors former ambassadors by allowing us to continue to use our titles. You mention several fellow female ambassadors—is the world finally coming to its senses and allowing women to rule the world? I’m a big believer in the 50-50 model. What do women bring to the job? I’m not an expert on this. But I do believe that gender diversity in the workplace creates a more effective and productive environment. People often ask me what the challenges of being a woman in this job were. I respond that when the name card on the table in front of you says “United States of America,” it doesn’t really matter what your personal profile is. What did you bring to the job? 18 years of experience in the private sector, determination to do the job at least as well as a career foreign service officer, and a lot of faith and understanding of the power of democracy. I’ve always been a patriot – my father raised a glass almost every night at dinner and said “God Bless America!” But I came away from my service with a deeper understanding of, and appreciation for, the greatness of our country. These are not easy jobs to come by. But whether it’s in an official role or not, I will always be dedicated to the advancement of American interests and values in the world. I’ve been invited back to serve as a fellow at the State Department. So I still have the opportunity to check in and consult. 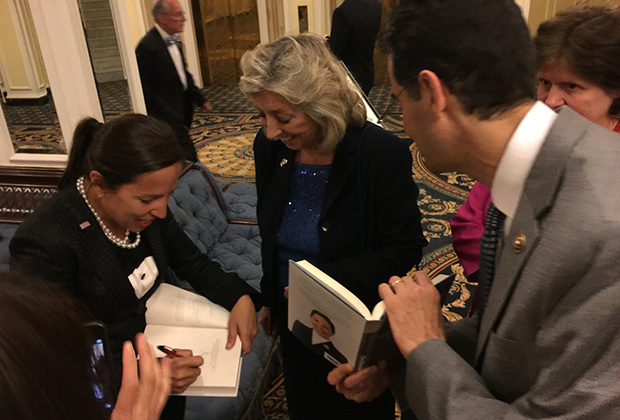 I was 43-years-old when I was sworn in – which makes me one of the youngest women to serve as a U.S. Ambassador. 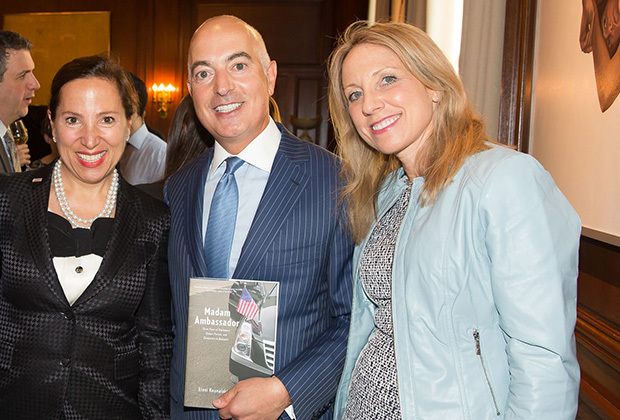 I am also the first; and so far only Greek American woman to serve in this role. Now that I’m almost 50, I’m more willing to be the role model – particularly for young Greek American women – that people sometimes say I am. 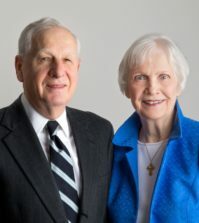 How did it change the dynamic with your husband—himself an accomplished internationalist? My husband is an accomplished internationalist… and as a result of our time in Budapest, now has a PhD to add to those accomplishments. But also, as I write in my book, it wasn’t easy at first. 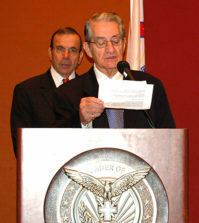 Though it was originally his idea, and largely through his support, that I was able to serve in this role. What did your father think of the experience and how did you share it with him? My father was and still is very, very proud. How are you involved in Mrs. Clinton’s campaign—is this a fulfillment of a dream for you? I used to think it would be the fulfillment of a dream. Now, I just want the best, most powerful and effective leadership for our country. I have seen Hillary Clinton at work. For three years while she was Secretary of State, I read her daily schedule each morning. I know that she has a vision for the future, and clear-eyed understanding of the challenges facing the country and the world. What will propel Mrs. Clinton’s campaign in a country with post-incumbent fatigue and a seeming Balkanization of the Democrats to the big cities and the Republican majority in state houses? Whatever our challenges as a country, we can never stop trying to make things better. The United States is defined by our optimism. We are the ‘can do’ nation. So like any challenge, you roll up your sleeves and get to work – in this case, getting out on the campaign trail and talking about the issues. I don’t know… but I enjoyed writing this one a lot, so maybe there will be another in the future. 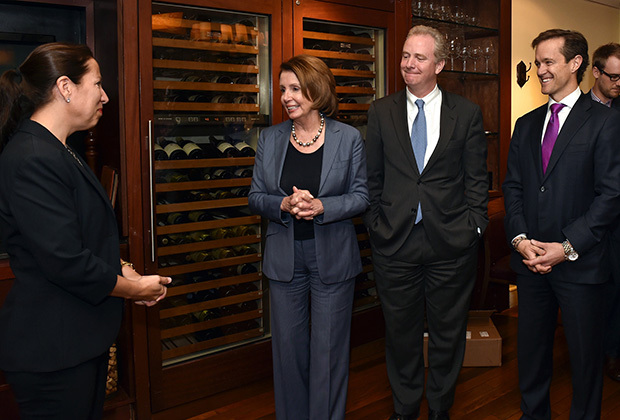 I am the chair of the California Advisory Council for International Trade and Investment. So I’ll be keeping busy with that, and in understanding the trade deals that are being negotiated right now. And of course, you will see me out on the campaign trail.